Initially, you can only race in the stock, rally and F3 races. As you win races, you will accumulate points that will allow you to play new races. If you finish a race at first place you will receive 9 points, you get 8 points if you finish second, etc. If you finish 10th or later, you will not score any points. There are 16 different tracks for F1 cars. As you win races, you will be able to play more tracks in the F1 car category. To complete the game, you have to win all of the 16 F1 tracks. There's a grand total of 21 tracks. 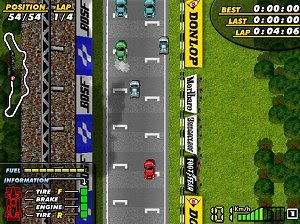 The first races are the easiest: the cars are slow and the enemies do not drive very well. But as you classify for new tracks the difficulty will increase: F1 cars are insanely fast! You will need a great agility to win in F1 tracks. Even though they look impossible to control at first, with some practice you can master the Formula 1 cars and win races. And if that's not enough, you can always show off your skills in multi player mode. During a race, you can bump into other cars and into the side boards and other obstacles. This will damage your car. In every track, there is a pit lane (labeled with the letters "PIT") where you can fuel up and repair your car.